This is the first look at a driverless car which could be the future of public transport. The Smart Vision EQ ForTwo is a fully-autonomous electrical vehicle. The concept car has no steering wheel or pedals, the first in the Damiler Group to get rid of the features. Glowing panels on the front and side of the vehicle will allow passengers to identify it as their car once summoned via an app. It will greet them with a friendly message when it arrives at their chosen pick-up location. The electric vehicle will be showcased at the 2017 Frankfurt International Motor Show later in September. “The Smart Vision EQ ForTwo is our vision of future urban mobility,” says Smart chief executive officer Annette Winkler. Once operational, people would hail a car on their mobile, similar to how people request an Uber now. LED displays on the Black Panel at the front will explain the car’s status, alerting pedestrians and other road users to it’s next move. 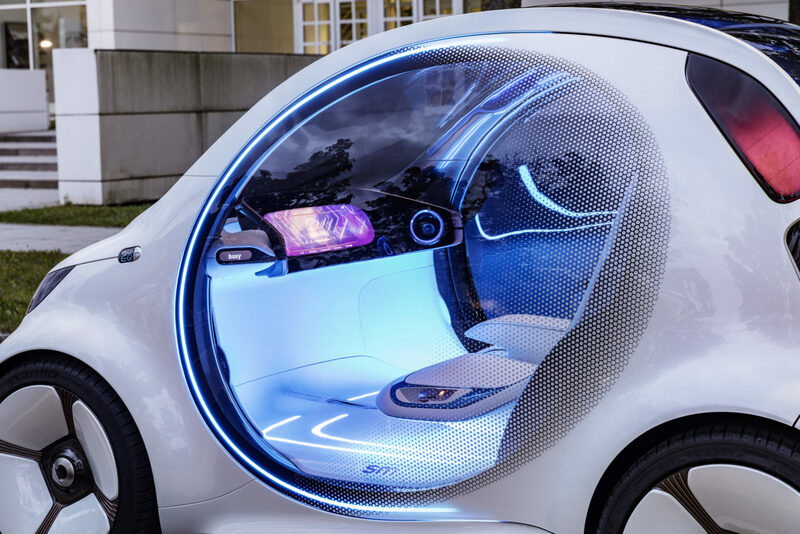 It would also display if there was one or two people in the car while the doors could display information about local events, the weather, news or the time. When not in demand, the vehicle will make its way independently to a charging station to load up with new energy. It features a rechargeable lithium-ion battery with a capacity of 30 kWh. Alternatively, the cars can dock with the power grid inductively, feed in electricity and act as a “swarm battery”, taking pressure off the grid. Once a car is requested, it will be for the collective group of vehicles to determine which car attends a pick-up. A spokesman for Smart said: “Thanks to swarm intelligence and the resulting predictability of demand, it will probably already be nearby, making the journey to pick up a “hire car” a thing of the past. The interconnected vehicles are always on the road. If a solo passenger hails one of these cars, they would be able to choose if another rider accompanies them on their journey in a function known as 1 + 1 sharing. Possible passengers will be suggested on the basis of their saved profiles and current travel plans.